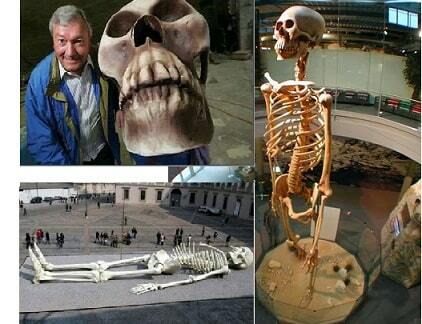 Tales and traces of a race of extraordinarily large humans, some say giants, are scatterred across the globe. In the Americas there seems to be a concentrations of these extinct people. Nevada has the giant remains discovered in lovelock cave, the Ohio valley and vicinity has the midwest mound builders , the martindale mummies from the west and so forth are examples from the USA. Further South, in South America there is the Quiname giant legends from Mexico and the "Lost City of the Giants" in Ecuador. For decades the vicinity of ecuador where this 'city' was discovered as well as neighboring Peru has hosted multiple discoveries of what people claim are Giants bones, and other unusual artifacts. Many of these skeletal remains are squirelled away by locals and regarded simply as a curiosity and something worth holding onto. Catholic priest Father Carlos Miguel Vaca Alvarado [1912 - 1999] left behind a small trove of these remains in his private collection. Most of Alvarados bone collection comes from a site dubbed 'Changaiminas'. Its full name is 'Changaimina-La Libertad' and contrary to what many 'Oh ma gawd' sources are claiming it does not translate to 'Gods cemetery' . Etymologically it is a combination of 2 words 'Changa', meaning 'Leg' and 'Mine', which means 'Vein' and is believed to refer to a Gold Vein or Place of gold not 'Gods Cemetery'.. The Father Alvarado collection was assembled and displayed in the 'Museo del Padre Vaca' [Museum of Father Vaca]. The collection contained bones of giants supposedly seven meters [22 feet] tall that once roamed the Ecuadorian jungles and foothills. Other artifacts in the Alvarado collection included bizarre utensils designed for unknown purposes and 'mysterious' compounds allegedly with magical properties. Samples of bone fragments were allegedly sent to the Smithsonian for analysis, but disappeared into the abyss as so often happens with anything sent there. When Father Vaca died in 1999 the story states his museum was looted and its contents evaporated into another abyss..
Across the Alantic, in Switzerands Mystery Park en Interlaken there is a recontruction of some of the Ecuadorian bone fragments, photo below is a reconstruction of a 20 foot tall giant based on the story from Ecuador. Local Ecuadorian legends, like so many worldwide speak of a bygone era when Giants walked the Earth, and built huge megalithic cities. One such city may well be the Lost City of the Giants. In order to locate this legendary lost city, explorers employed locals who were aware of the legends and bore a knowledge of the terrain. The researchers were led a quasi holy site as some have claimed. Apparently aboriginal tribes gathered here periodically to mingle with powerful spirits they believe still inhabit the ruins. Researchers discovered what they described as a set of megalithic man made structures, highighted by a 260 foot tall by a 260-foot wide irregularly shaped pyramid. Other questionable structures at the site weren’t all that awe inspiring and only mildly impressive. Mainstream scholars believe the city is a figment of imagination borne out of over exuberance by researchers. The pyramid they claim is not man made, nor are the lesser structures, but instead are naturally formed. 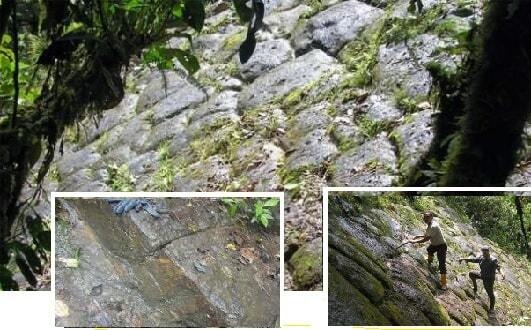 The Ecuadorian Government sent representatives to investigate the site which concluded that the pyramid shaped structure was a natural formation. The researchers of the Fentom group believe the complex pattern of the boulders used in the construct, and their fine assembly are clear indications that the 'lost city of giants' is not a natural formation but evidence that supports the theory that Giants once walked on Earth. In addition to the structure[s] unusually large bizarre ‘manufactured tools’ were located at the site. Assuming these were tools, their grandiose size would render them impossible for modern humans to use. Bruce Fentom described them as oversized hammers that he believes were once attached to hardwood handles.